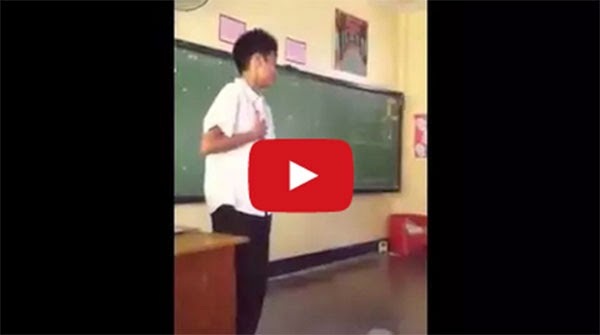 A video featuring Justine Andrew Cruz, a student of Batasan Hills National High School, belting out the popular song "Mula sa Puso," has gone viral. Wearing a red shoe cover (shoe rag), the grade 9 Special Program in the Arts (SPA) student effortlessly sang the all-time hit infront of his classmates at BHNHS in Quezon City. The performance made one of his female classmates twitterpated, as seen in the video. The two and a half minute video got more than 80,000 hits on YouTube, but when radio station TeeFM posted it on its Facebook page, it garnered over 97,000 likes, 25,300 shares and 1.2 million views as of this posting. The raw video made its way online on Sunday, November 30, the same day GMA-7's weekly news magazine show Kapuso Mo, Jessica Soho paid tribute to the original singer, Jude Michael. The timing is just perfect as Jude is reportedly set to release a new album early next year. Maybe he can invite Justine, the latest Filipino internet sensation, to sing with him in one of his shows.